Annapolis - Alligator in Ego Alley?! Still at Poughkeepsie Yacht Club! It was a perfect day for southing with winds 5 to 10 and 1 ft waves. We got off our anchor in Solomons at 7:30 and covered the 57 nm to arrive at FBYC by 3:00. 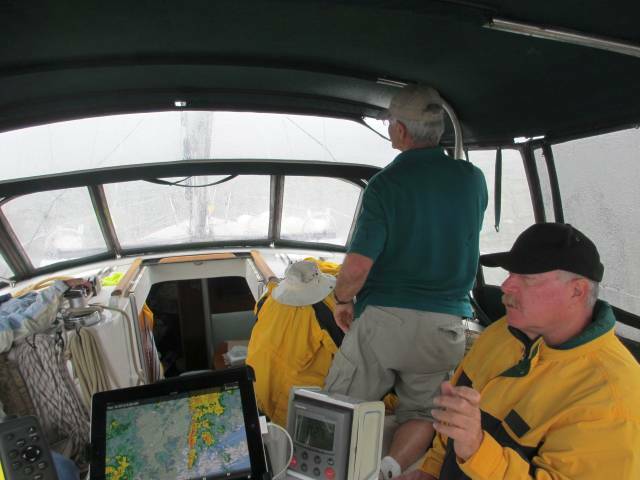 We picked a calm day to pass across the mouth of the Potomac River, a notoriously rough passage. Today it was very tame for which we were thankful. 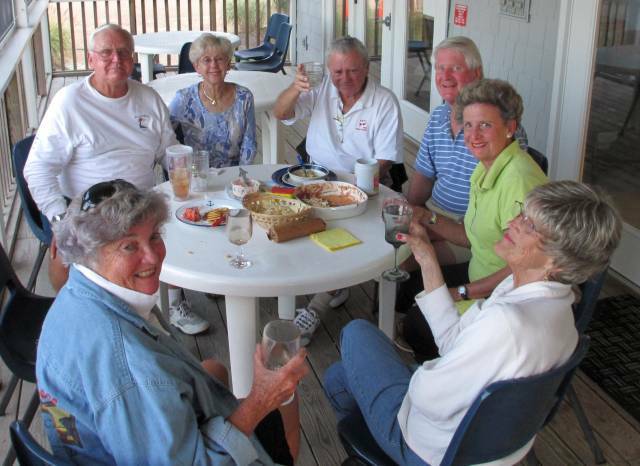 We phoned ahead for a slip at the Fishing Bay Yacht Club, one of our favorite stops on the way south. 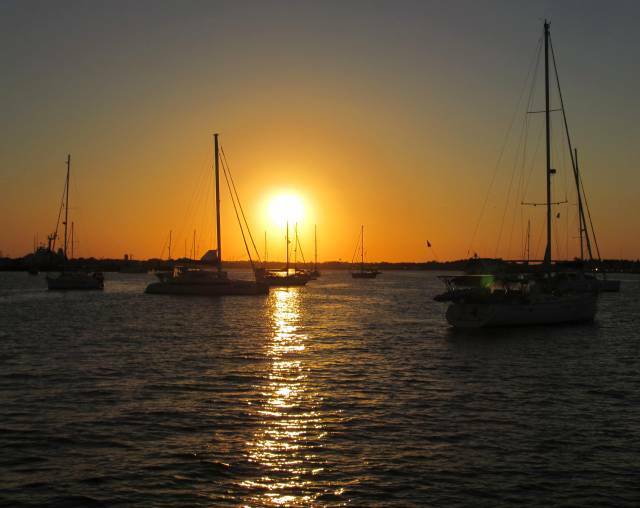 It is completely protected in all directions and they offer one day of complimentary dockage for members from other yacht clubs. The grounds look out over Fishing Bay and also over the back creek where the boats are kept for best protection from weather. It was a Sunday night and they were almost full but the steward found one slip for us several docks in from out customary facedock. Buddy is seated just above Ann. 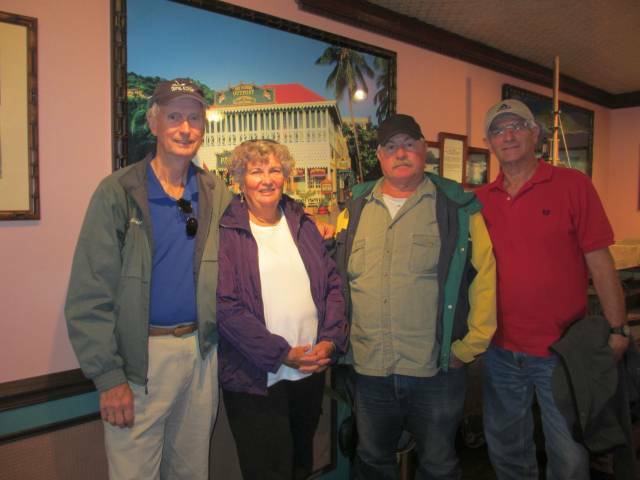 Great time with friends - one of the joys of cruising!! 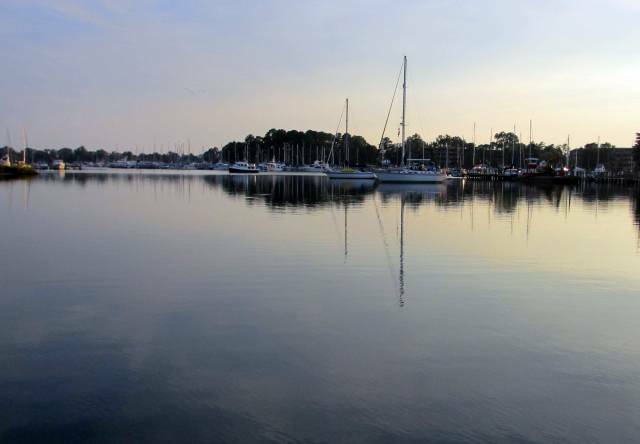 On Monday we're headed to Hampton and the Public Piers Marina for three days. 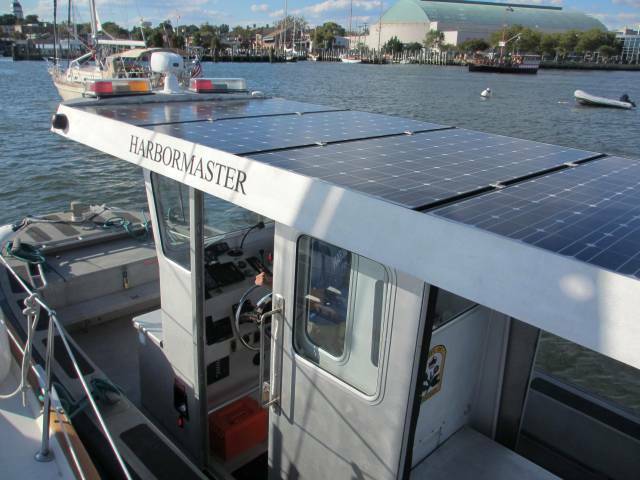 We plan on provisioning and getting ready for entering the ICW to the Dismal Swamp Canal. Now our trip south starts in earnest with Mile Marker One by Norfolk. Another perfect day of full sun and warm weather, in the 70's. After all the preparation of gathering oils and filters yesterday, today was the day of execution - the main engine and genset oils and filters have been replaced. It's gotten to be a fairly routine thing to do by now. I use a manual vacuum oil pump that seems to work well. It takes two tries to get the 2.5 gallons of oil out of the main diesel.. The genset was next and the only thing left now is the outboard oil and gear oil, usually rather messy. I'll do that in Hampton. Unfortunately, the inflatable patch from Tear Aid seems to be lifting. It has developed a bubble where the air was seeping out through the fabric. Eventually, the bubble will reach the edge and the patch will give way. I'll fall back on the tried and true two part adhesive for hypalon which I should have used to begin with. Live and learn, the mantra of boaters. We tried the rids from Boomerang's which is a 5 min walk from the Holiday Inn. It was very good. The ribs were tender and the crab puffs we ordered were a great plus. We would go back again. The weather forecast was changed for Sunday and now it looks like a good day for southing. 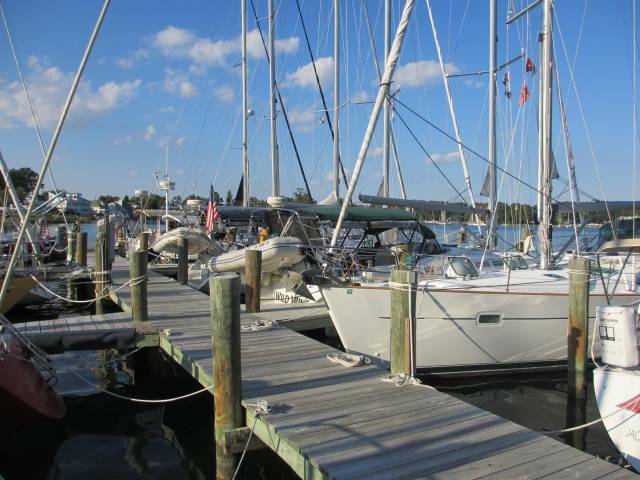 We plan on making Deltaville and the free dock at the yacht club, a 57 nm trip. That would leave a short jump of 35 nm or so to Hampton for Monday. It's been a nice time here at Solomons in the Holiday Inn anchorage area, perfect for relaxing and catching up on boat chores. The coastal forecast for the Chesapeake was for 2 to 3 ft waves and a south wind which is not wonderful for going 65 miles to Deltaville. So we are going to wait out the weather until it's perfect which is due Monday and Tuesday but you know how that goes! With any luck we'll be in Hampton on Tuesday night. One of the reasons we like the Holiday Inn anchorage is not only the dinghy dock provided by the hotel for a nominal fee ($2/day) but also it's only 5 minutes from West Marine and about 20 minutes to Food Lion, the only supermarket close by. Best of all, it's free (except for the $2/day)! If you only need 7/11 type supplies, there's one about 5 min away. So we are waiting out the weather while I do my boat things and hopefully we'll be able to move on Monday. With 5 kt winds and 1 foot waves, it was perfect for motoring so we took advantage of the weather to reach Solomons. The best anchorage is all the way in next to the Holiday Inn. They have a dinghy dock that you can use for only $2/day and they sell ice and there's a grocery store about 15 minutes to the north on the main road. If you wait to use the shuttle, you can reach the Wal-Mart nearby and other stores in the shopping center. We're happy with the supermarket which also has a Redbox for movie rentals. There's a West Marine about 5 minutes away and some fast food restaurants along the way. Unfortunately, we get no TV stations over the air, a rarity along the way south. I guess the Solomons are too far out in the boonies for decent reception. However, there's good Verizon internet speeds so we're connected. The anchorage here is perfect for waiting out for good weather. It offers 360 degree protection and pleasant surroundings. Our next jaunt is to Deltaville, about 65 miles south so we're looking for a perfect day with little to no wind and no waves. Any wind this time of the year and the Chesapeake can get really churned up, especially when crossing the Potomac. With a West Marine store nearby, there's a few chores I have scheduled that include changing the oil and filter on both the Volvo main diesel and the Panda genset, putting a patch on the dinghy (a worn spot that's developed a slow leak) and probably a few other things I'll think of when going through the store. There is always something to do on a boat! Today was a day of rest. It was not a day for great accomplishments. 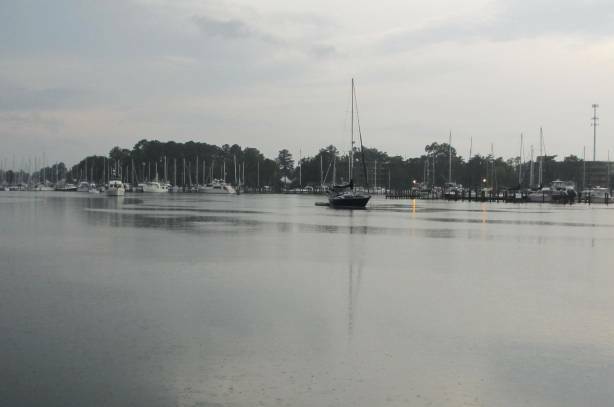 There was a small craft advisory out for the bay so we stayed in the harbor today and we're hopefully looking to Thursday as a good day to head further south. 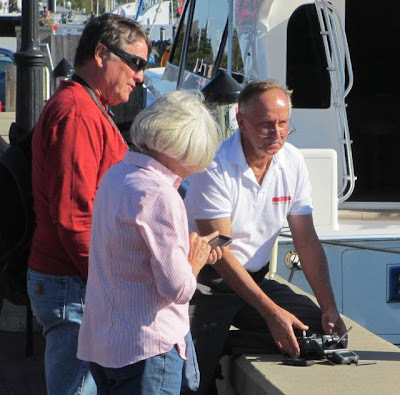 I had bought a new set of 4D batteries in Milford, CT when in Long Island Sound this summer and the time had come to check water levels - which were fine when I looked. My previous 4D batteries were over 4 years old which is normally okay with seasonal use but we're on the boat 9 months out of the year now so we are heavy users of batteries. We looked at articles in Practical Sailor and other publications to decide on the brand to buy and settled on just replacing them with the same manufacturer - Ultrapower - which had given good service to date. Unfortunately, that brand was not available in time so I settled on Interstate 4D's lead acid. It was the right choice! First, I wanted lead acid and not gel or adsorbed glass mat because I wanted less sensitivity to charging voltage. My charging system can't hold voltages to 0.1 volts. The lead acid cells are very forgiving in that respect but the other types are not. Second, when the old batteries were being removed, the installer noticed that the new batteries were much heavier, about 10 lbs heaver! In my book, the more lead the better in a deep cycle battery. In actual use they've been phenomenal. I have three on board for a total of 585 amp-hours of output. An overnight anchorage hardly makes a dent in the 4Ds. If we're travelling every day I don't have to run the genset at all, even with running the microwave, TV, electronics, etc. at night. Interstate is the largest selling brand in the US and lasts the longest according to surveys and they received the highest rating from Practical Sailor, above many of the more expensive brands. The island in the picture yesterday is used by all for pet relief. You almost have to look for an opening and speed to the beach for Hoolie to get an uninterrupted session. We had several people drop by for a visit today. 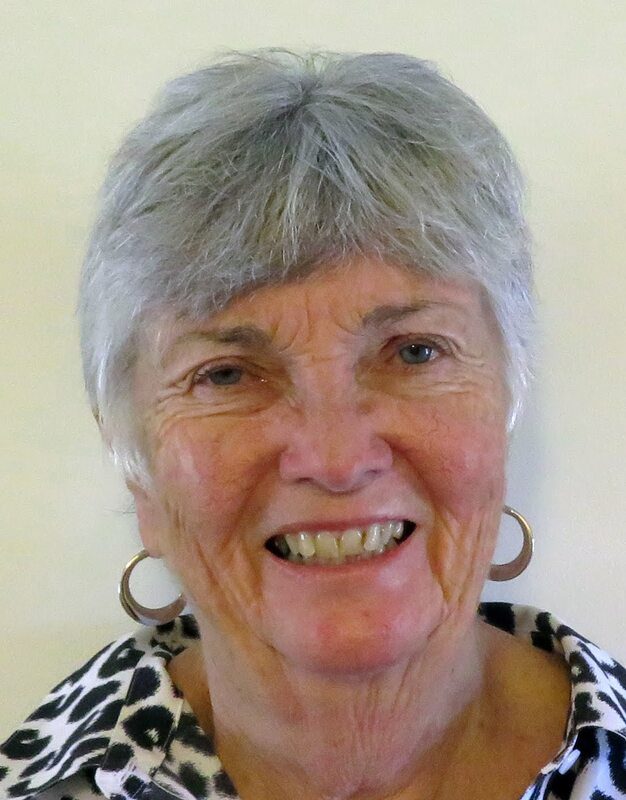 One, Benjamin Wilson, said he met Mary Silverstein at PYC, small world. The anchorage is adding a lot of boats everyday in preparation for the Seven Seas series of seminars to start Friday. We hope to leave Thursday for Solomons. A deserted island with a sandy beach - priceless! 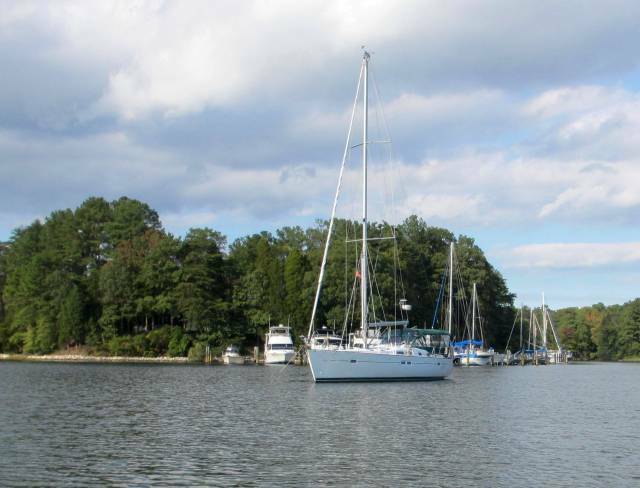 The winds were due to be out of the southwest and south over the next few days and since we've experienced very rocky moorings at Annapolis under those conditions, we decided to move south to the Rhode River anchorage. You would think that the moorings would be very protected but with winds out of the south the waves just roll around the corner and come directly into the mooring field, causing the bow to bob up and down about a foot, very uncomfortable at night. There were small craft advisories out until 10:00 and then were reinstated at 4:00 pm so we ducked out around 10:00 and made it into Rhode River by noon. We later learned that the Coast Guard never cancelled the 10:00 small craft advisory, plenty of wind and waves on the nose! 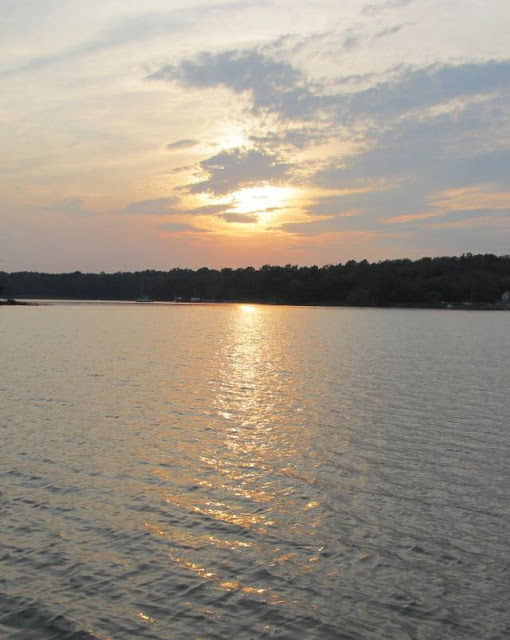 The anchorage here is completely protected on all sides with good holding in 10 ft of water. Most importantly, there's a convenient, deserted island perfect for Hoolie relief. 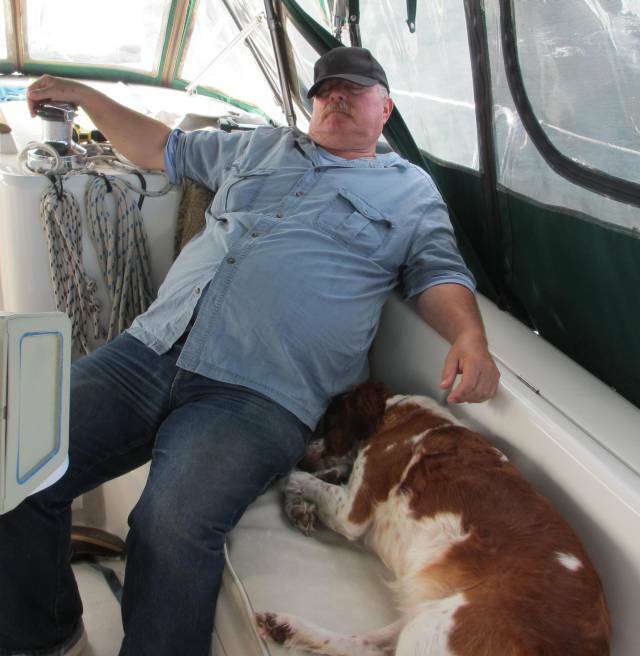 You just have to time your use in-between other boaters with dogs having the same requirement. An Alligator in Ego Alley in Annapolis! The first order of business was to clean the dinghy. The ducks found it last night and it was covered with the by product of their digestive systems. There is a large population of ducks in the area since they are amply fed by the tourists - and now I know where they go at night! It sure caught Hoolie's interest! 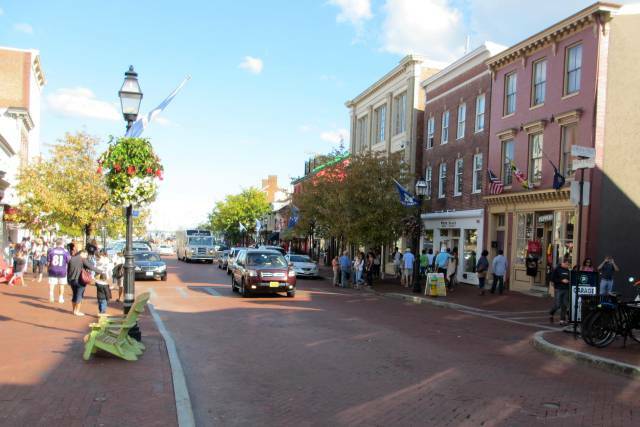 Joe and Rudy left today for home in a rental car and I headed back to the boat for the usual chores (laundry, pump out, ice, various supplies...) On the way in we saw something moving in the water in Ego Alley, right in the middle of Annapolis. 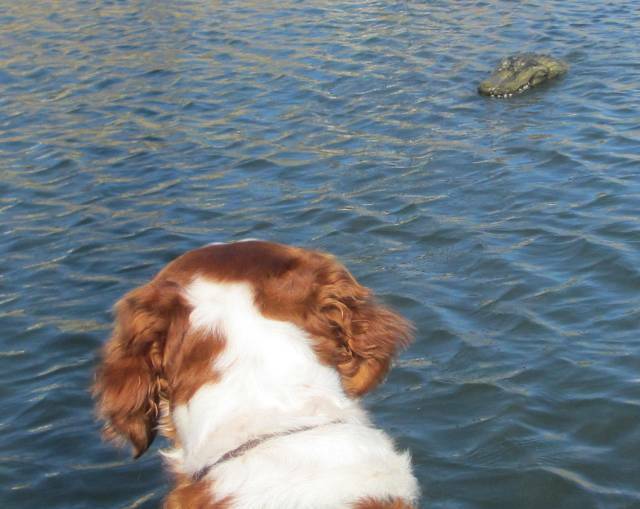 It appeared to be an alligator! The guy in the kayak seemed not too concerned as it moved around his rather fragile vessel. This can't be we thought, alligators aren't this far north! But then there's the evidence. When we returned to the dinghy for the trip back to the boat, the "alligator" headed for our boat with Hoolie showing great interest. We figured out that the "alligator" was a remote controlled boat made to look like the head of an alligator. It looked pretty realistic, enough to fool us for awhile. On Tuesday we're headed for Rhode River and some rest while the coming storms pass through on Tuesday night and Wednesday. Hopefully there'll be enough gaps to get Hoolie ashore. We had conflicting weather reports Sunday morning. The Weather Channel said light winds and full sun. Grib said 5 to 10 kts out of the northwest. The NOAA coastal forecast said a small craft advisory until 1:00 pm with winds 10 to 15 and gusts to 20. Who to believe? 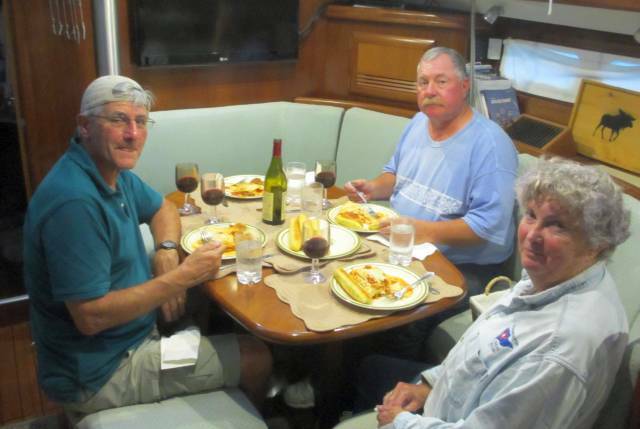 We had just endured a 65 mile trip up Delaware Bay in 20 kt winds (gusts to 25 and 3 ft waves) and didn't want to "enjoy" another such experience so soon. We finally placed our faith in grib based on past experience and we set out. This time our faith was rewarded, grib was right, NOAA and the coastal forecast was wrong. We got some sailing in for a change - it was not small craft advisory weather! Rudy surmised that perhaps the Coast Guard just wanted a day off (Sunday) so issued a forecast to scare boaters off the water. It definitely didn't work since there were more boats out today than I've ever seen around Annapolis. 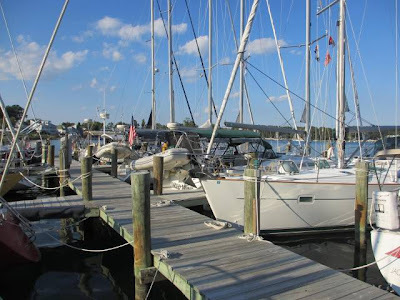 There is no anchorage that's any good close to Annapolis downtown so we took a town mooring. When the launch came out to collect the $30 fee, I discovered that it was an electric/diesel hybrid. The roof of the launch was completely covered with solar cells (I wonder if the gov't paid for any of that?). He was currently running on diesel power when he pulled up. Downtown was packed!! It must have been homecoming or something, never saw so many people in Annapolis! Rudy and Joe took us out to dinner at Pussar's and we started out by having one of their famous Painkillers, a very fine rum drink. Dinner followed and we all had a good time. They will be leaving us Monday morning for the trip back north via a rental car. It was great fun having them aboard and we will sorely miss their good humor and great help in running the boat. It was another "crack of dawn" day. We had 65 miles to cover and had to pass through the Cape May Canal at low tide in order to clear the two low bridges. They are advertised as 55 ft at a normal high tide. Our mast is 55.3 feet high so we need a little help from the tides. Still, it's daunting to approach the bridge which is built in a very solid manner and knowing that your slim mast would be destroyed if it came in contact with that bridge. However, we've been through the canal multiple times and survived so we were confident that we could pass once again. With a low tide of 0.4 over datum, we figured Fleetwing had three feet to spare. The power boat behind us was watching us pass under the first bridge and hailed us on the VHF with the message, "You cleared that bridge by 2 or 3 inches!" Now we know that wasn't true and we had one more bridge to go at the same height and the tide was rising. 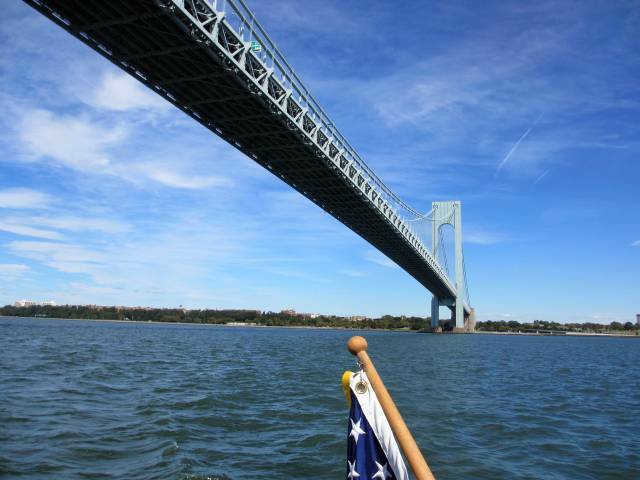 It is very deceiving to gauge the relative height of your mast and a bridge from the ground. You're looking up at an angle and the mast always looks higher than it really is. Needless to say, we survived the bridges and a shallow spot (down to 5.5 ft MLW) just before the ferry terminal and headed out into the bay. The 0 to 5 kts of wind we experienced in the canal suddenly spiked to 20 kts with higher gusts! With the tide still outgoing, it was wind against tide and the ride was wild (once again as reminded by the crew). With the waves hitting Fleetwing broadside and the wind blowing the spray, it presented an exciting picture - unfortunately, I was too busy to take any pictures or videos. The excitement continued for the next 5 hours until the outgoing current finally died out and the bay narrowed as we headed north. There are some very large ships going through the Chesapeake-Delaware Canal! Entering the Chesapeake-Delaware Canal the current was against us once again. 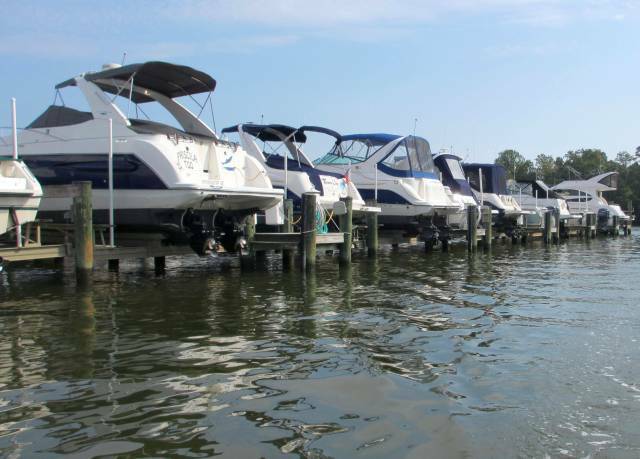 We were concerned about what to expect at Chesapeake City since there were so many boats at the Cape May anchorage (14 in all, more than we had ever seen previously). 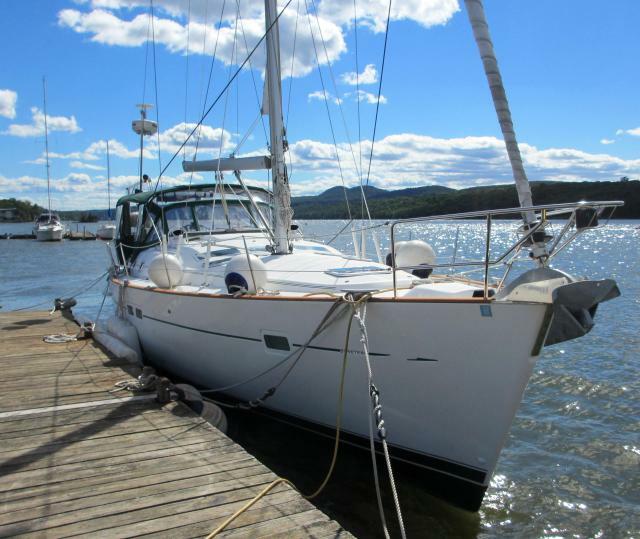 Sure enough, the Chesapeake City anchorage was almost full but we were able to find a spot and anchored in 15 ft of water with only 60 ft of chain for a 3:1 ratio (counting 5 ft for the water to bow height), a little on the weak side but we couldn't afford to swing very much. As luck would have it, a thunderstorm came through with 20+ winds but we held okay, even on such short scope. I'll describe our new ground tackle at another time. On Sunday we have to decide whether to press on to Annapolis given that there's a small craft advisory as of tonight for Sunday. I don't think the crew or captain wants another wild ride so soon. Today was a much better day for moving. The seas were 2 to 3 feet which moved the boat around but still better than yesterday and there was full sun which warmed the cockpit. We took it easy in the morning and didn't leave until 9:30 and reached Cape May by 2:30 only to find it full of boats! I guess everybody had the same idea. When you travel up the Delaware Bay, you want an incoming tide to help you along. Ideally, you want the favorable tide to start at daylight so you can make it all the way to Chesapeake City in one day. Such is the case for a start up the bay on Saturday and everyone else figured the same thing apparently. Still, we only draw 4' 9" and could fit in between the anchored boats and shore. I sounded out the shallows to be sure we had enough room to swing so we're fine. Tonight it was steaks on the barbie and all was right with the world - especially after two of Rudy's beers and our glasses of wine. We get very clever after a few glasses and could have solved all the world's problems (if only they would listen to us...). Now it's very quiet and as a prelude to a 6:45 am start Saturday morning so we can catch the low tide to duck under the 55 ft bridge (we have a 55' 3" mast but the 55 ft number is at high tide). There's a little wind predicted but hopefully we'll get up the bay before it hits us. We're headed for Chesapeake City and it looks like there'll be a lot of us there judging from the number of boats in this anchorage. We got up this morning at 4:00 am and took Hoolie ashore. Unfortunately, it was a low tide and Ann had to wade ashore with Hoolie for the last 100 ft or so. Hoolie was not certain he wanted to do that but with a little encouragement (poke, poke...) he finally jumped in and found the water to be only a couple of inches deep. Getting back in the dinghy was another challenge but then I had to paddle the dinghy to deeper water for several hundred feet before I could start the outboard - all this in pitch black darkness (there was no moon and no on-shore lights). We weighed anchor at 5:00 and were off. Joe and Rudy help greatly with spotlights to look ahead for lobster pots and we avoided them all. Rounding the corner, we found 3 ft waves coming in against the 2 kt current and it got quit rough. Fleetwing slammed down and pitched about as the waves passed underneath, not comfortable at all! This continued for about two hours before it slacked off a little but the boat was still slewing side to side making for a very upsetting ride and causing upset stomachs. The captain and two of the crew didn't feel very well but Joe was unaffected, "Quite enjoyable", he commented, certainly not boring. 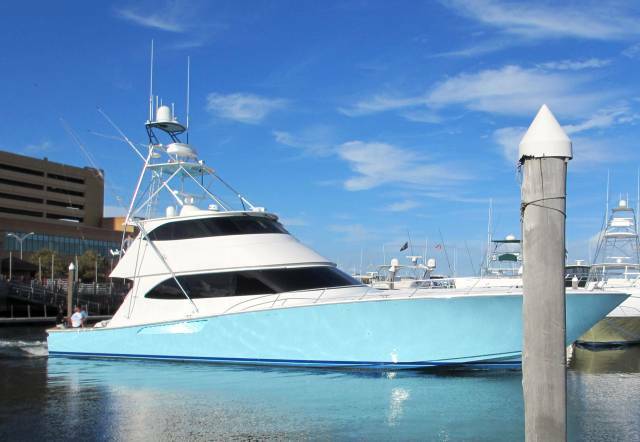 Golden Nugget - Home of Viking Boats at dock, here's a brand new one, 82 ft long! About halfway through the 10.5 hour ride, the wind and waves lessened and the ride was normal, conversation in the cockpit resumed! The boat responded well, no problems, just rougher than we had expected. 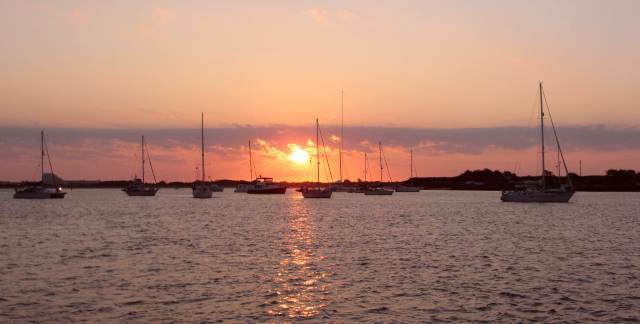 On Friday we hope to reach Cape May for the night at anchor if the weather holds up. We spent a very quiet night in Haverstraw Cove. The rain stopped around 10:00 and the wind died down. We got up at a normal hour of 7:00 and left around 8:30, just after low tide and still had 5.5 ft MLW on the way out. The day was beautiful with full sun and calm waters. What wind we had was from the north so it helped push us south. 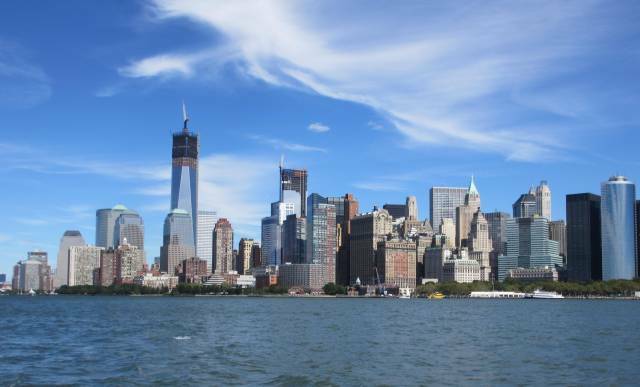 New York Harbor was as calm as we've every seen it and with the good visibility, there was no problem avoiding the many water taxis and barges. With the full sun, the enclosure was summertime warm, very nice. The view of Manhattan was spectacular! Onward we went to Atlantic Highlands and found many boats waiting for the same weather opening we were looking for. There was a small craft advisory out for today but Thursday is predicted to be perfect for the trip south to Atlantic City. We did expect some windy weather on the way south but not this windy! The winds averaged 20 to 30 kts with gusts to 40 and one gust to 51 kts! The rain had arrived at 6:00 am and the wind picked up mid morning. 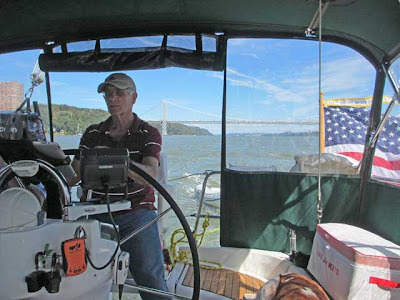 As I covered yesterday, we wanted to catch the predicted good weather on Thursday for a passage down the coast to Atlantic City and so had to arrive at Atlantic Highlands by Wednesday which necessitated a Tuesday departure date. By 10:00 we were taking water over the bow and some were high enough to splash the dodger. We would have been soaked without the dodger and bimini! 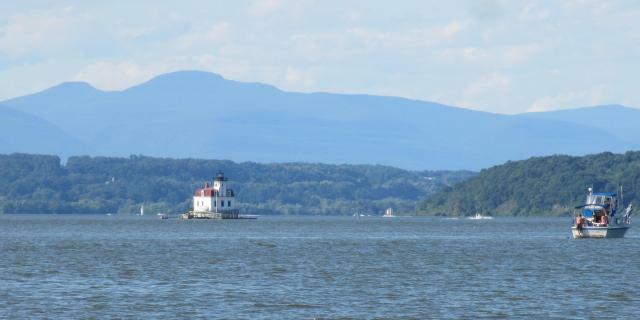 We arrived at Haverstraw Cove by 1:30 and were we ever ready for a break! The route in is narrow but we've been in there before an just followed the GPS waypoints in the charts I posted yesterday and found no less than 6 ft MLW but you had to be careful to keep on the waypoint route given the wind and waves. We made it in safely and the change for the better was immediate, no wave action and very little wind. We nosed into the south corner and dropped the hook, whew! What a ride today. Dinner courtersy of Elaine Ling, thanks!! 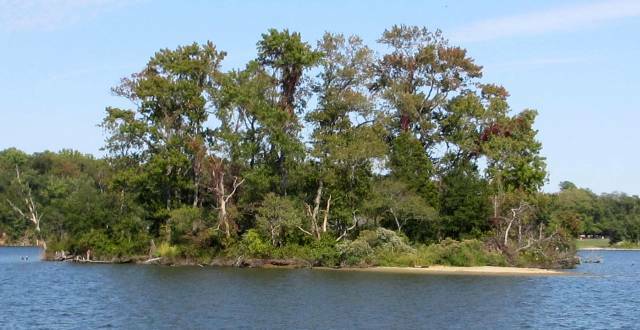 Wednesday we'll leave at our leisure, probably around 9:00 and aim for Atlantic Highlands. It should be a much better day. 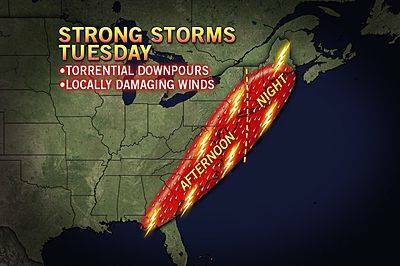 First here is a weather prediction map showing what's expected on Tuesday on a storm moving up the coast. We plan on leaving early Tuesday morning to reach Haverstraw before the worse of the storm hits us. However, you can't just anchor anywhere out in the bay and expect a protected anchorage. 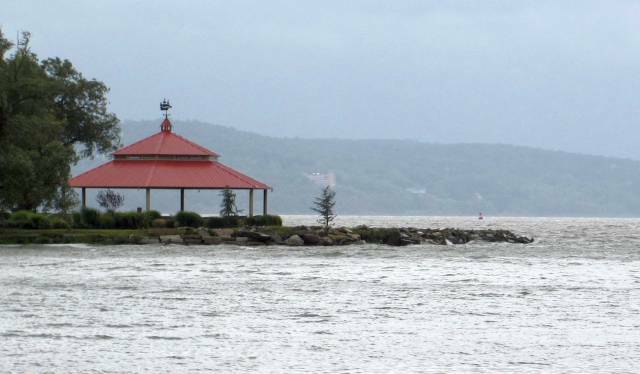 Behind Croton Point is no good since the wind is predicted to veer from south towards west and north west later in the day. Hook Mt is no good due to the initial south winds. That leaves what we've dubbed, Haverstraw Cove. 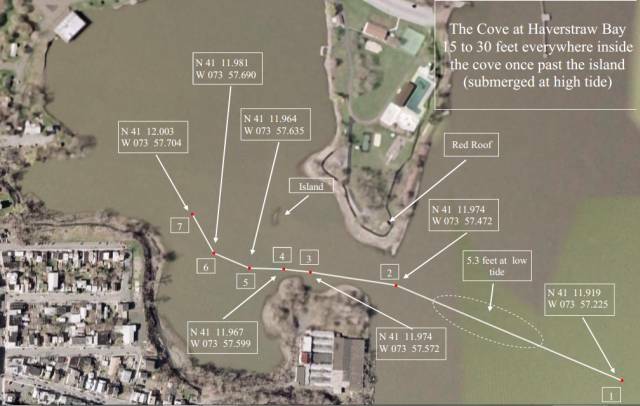 It's by the town of Haverstraw but the cove itself has no official name and it has no soundings marked on the NOAA chart. Regardless, the locals use it all the time and one taught me the entrance path. There's a brick wall underwater on the north side of the entrance that snags a few boats every summer and a sunken barge a little further in, also on the north side of the channel. I recorded my GPS points as I entered the cove and generated the chart you see above. Follow the chart and you'll be okay. We're going to anchor in the south part of the cove which is protected on all sides from waves and is protected from winds from the south and west, the major wind direction for the storm. The west shore is much higher than my mast, so it's a good spot. One may ask, why are we leaving with the prediction of such bad weather? 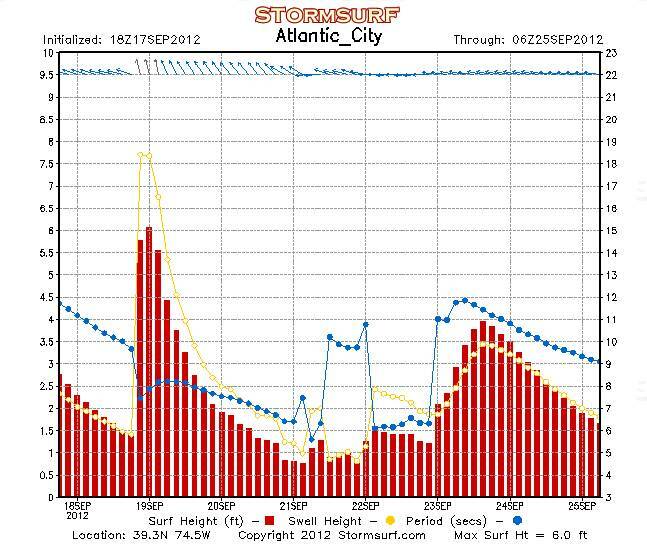 The answer to that lies in another chart showing the expected wave heights along the Jersey shore for 9/21 - 9/23 (the left scale is wave height in feet). 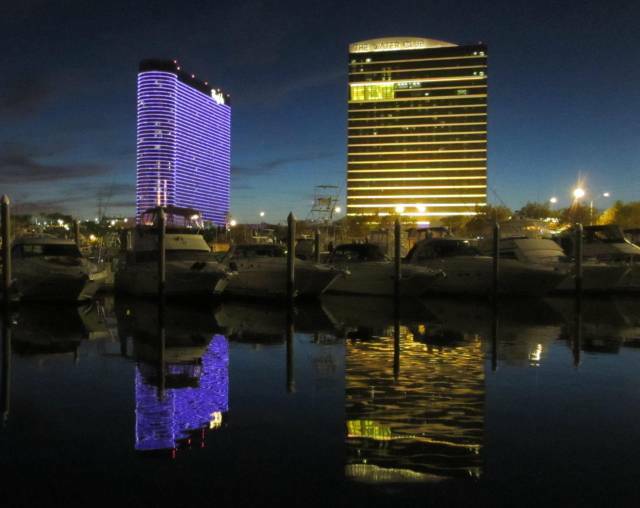 We plan on making Atlantic City during 9/21 and Cape May by 9/22 and then up the Delaware Bay on 9/23. The chart shows a window for doing that before the weather deteriorates again - so we're in a race! Of course, if the weather predictions change, we'll keep an eye out on the charts and change our plans accordingly. Safety is the first priority. With all that, we plan on leaving Tuesday morning as soon as our crew arrives so we can get securely anchored before the brunt of the storm arrives. When you're on a sailboat, you are one with the weather. On Sunday we loaded the last of the provisions and wondered about what we might forget, there's always something. In fact, when we sat down for dinner and looked for wine, there was none, ugh. Rudy had loaded his supplies that afternoon so we raided his store for a bottle of Riesling, oh well. We'll make a wine stop this afternoon. Tuesday is looking interesting. The morning should be okay with light rain possibly but a cold front comes through late afternoon and evening with strong winds predicted, calming down after midnight. We plan on tucking into the Haverstraw Cove we've used before. It's unchartered but we know the way in, having been there three times before. It gives 360 degree protection with high hills on the banks keeping the winds from showing their worst. We'll board Fleetwing late afternoon and the rest of the crew, Rudy and Joe, are due to arrive around 8:00 am Tuesday morning. Everything still looks doable for going down the coast but conditions can always change, we'll watch the weather closely. We had intended leaving Saturday, 9/15, for points south but the weather would not cooperate. There's a storm out in the Atlantic and another one coming off land that stirs up the water until Thursday when the seas calm down. So our plans are now to leave on Tuesday, 9/18, stop over at Haverstraw that night, spend 9/19 at Atlantic Highlands at anchor and then head down the Jersey coast to Atlantic City and the Golden Nugget on Thursday, 9/20. Of course plans are still subject to weather changes but it looks pretty good so far. Unfortunately, by starting out on Tuesday, we'll run into some rain before everything clears out for our Thursday trip down the coast. Meanwhile, we've been very busy getting the boat ready for our fall cruise south. Our teak was in need of work so I sanded it down and applied a new coast of Semco Honeytone sealant but gave up on the teak on the swim platform and ladder which sees a lot of saltwater. I replaced that teak with PlasTEAK and I'm thrilled with the results. 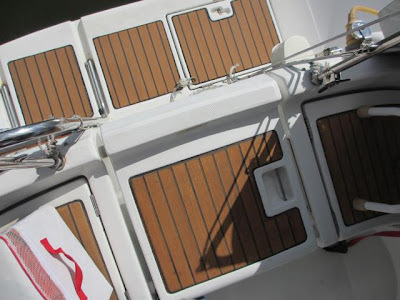 The color was a perfect match to the teak on the boat and, best of all, it requires no maintenance! The three steps of teak on the swim ladder were also replaced. The dealer in Ohio machined exact replacements complete with the grove in the back to fit the stainless steel support straps on the ladder. I just chiseled out the three pieces of old teak and sent it all in and they replaced it with drop-in PlasTEAK sections. It could not have been easier. They also supplied the adhesive, a specially formulated, black silicon based chalking. Next on the list was a new screen door to the companionway entrance. It's constructed of two pieces of clear plastic from Home Depot. 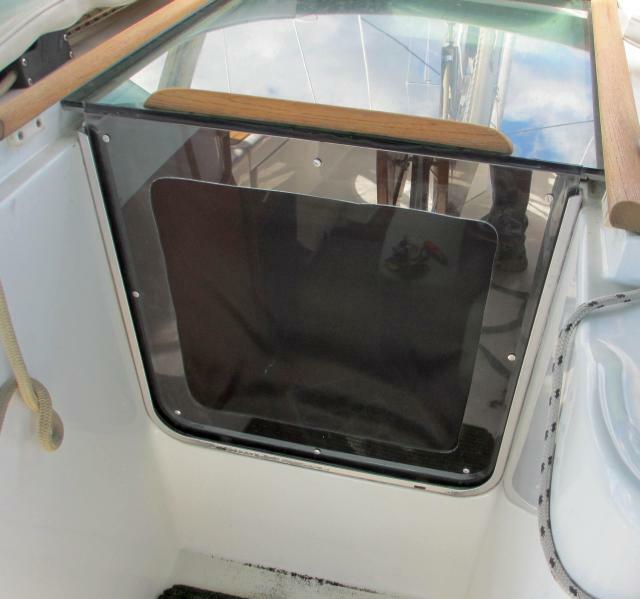 The concept is to cut out two pieces the size of the companionway and then fastened them together with screening material in the middle. It lets in light and provides protection from the insects. We use no-seeum screening to keep everything out! Finally, Brain McDonnell of McDonnel Marine (the primary Volvo repair and parts supplier for the Northeast) came out to adjust the valve clearance and in the process found a wear hole on the exhaust hose which I had not noticed. It was ready to leak but with his catch, I replaced the hose, whew! 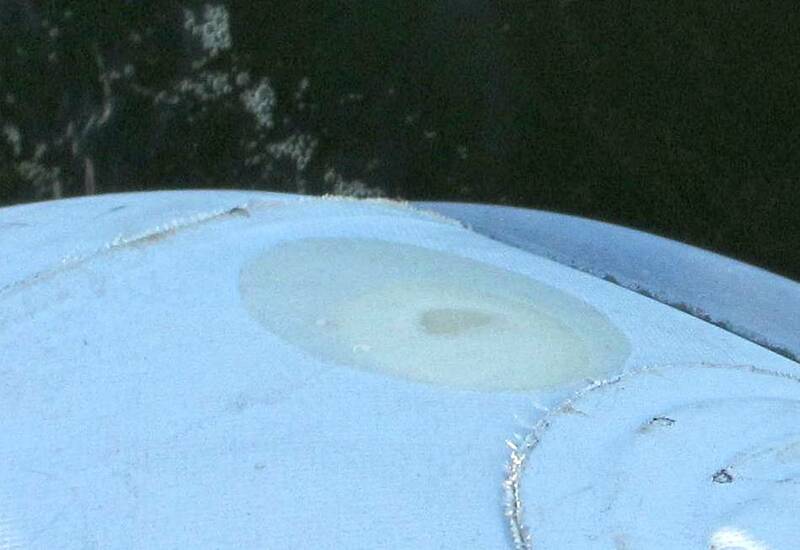 On top of everything else, the dinghy painter parted and the dinghy found a way to put a hole in the aft port tube! So I spent a week ordering a repair kit and repairing the dinghy and it appears to be holding air pretty well now but it's not been tested with use yet. I am gaining experience in areas of repair that I really didn't want to learn - but you have to in order to keep the boat cruising. 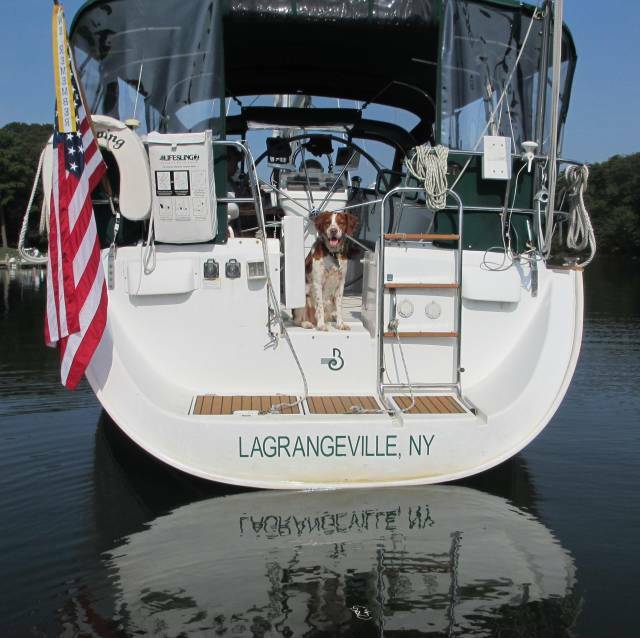 We'll have two crew with us, Rudy and Joe, from the Poughkeepsie Yacht Club for the trip down to Annapolis. It ought to be fun and we're looking forward to a good time.